Footballing loyalties are often hereditary. Teams from Premier League to non-league are passed down from every generation like revered family heirlooms. And once you have your team, your support is supposed to become an unswerving lifelong obsession. For me, in this respect, I’d always felt a little lost. Growing up in a family without such loyalties I was given a blank canvas. I watched Michael Owen dance around the Argentinian defence in 1998 and swiftly (albeit temporarily) became a childhood Liverpool fan. We occasionally went to Birmingham City games with my Uncle, who insists to this day on buying me a blue scarf every Christmas. I dotted around Premier League grounds after moving to London to try and find my footballing home. Alas, whilst thoroughly obsessed with the beautiful game, I never felt truly connected to one individual team. I’d generally became disillusioned with expensive tickets and stressful match day experiences. A couple of years ago however, a French friend (and fellow disillusioned football foreigner) suggested we go to a game at our local team Leyton Orient. Propping up League 2 and in freefall under the maniacal ownership of Francesco Bechetti, we saw the team demolished 0-4 by Northampton. The Os kept on losing and were relegated out of the football league the next season. Having been a penalty kick away from the Championship in 2014, relegation marked the end of a dramatic decline in fortunes. Bechetti was ousted, but he left a lasting legacy of mis-management, and the club were on the verge of extinction. In the summer of 2017, Nigel Travis – chairman of Dunkin’ Brands and lifelong Orient fan – bought the team together with American businessman Kent Teague. Employing former Orient manager Martin Ling as director of football, the club managed to save the team from administration and scrape together a new look squad ready for the start of the National League season. It was an appealing narrative to a couple of fans with nowhere to truly express their footballing passions. Whilst Leyton aren’t necessarily your typical conference side, their newfound position outside of the football league gave us a window into the hitherto unseen world of £1 sausage rolls and 100-seater stadiums. I immediately fell in love with the special charm of non-league football and everything it has to offer. There are intricacies found in here that cannot be found anywhere else. For the curious football fan, there are a number of reasons why it should be explored. There is a unique sort of honesty in away supporters at non-league football. Fans travelling up to Barrow-In-Furness on a Tuesday night are not exactly in it for the glamour. There is the customary banter between fans throughout the game. But there is a genuine respect for travelling adversaries as away attendances are announced over the stadium tannoy. The atmosphere is rarely confrontational. There’s a sense that each set of supporters is here to simply watch the game they love. Save the nastiness for days out at West Ham. Being so close to the action and being part of a far more select group of supporters you immediately feel more connected to the club. At Leyton Orient, one fan perhaps epitomises this connection more than any other. 84 year-old Lottie hasn’t missed a game home or away for over 45 years. Now something of a club celebrity, she greets the team bus at every away game and gets a hug from all the players and staff. Leyton is a club where players know the fans by name. It’s a special relationship felt by non-league fans across the country, and one you’d rarely find in the Premier League. At Premier League games, I often spent a good chunk of my day in some sort of queue. 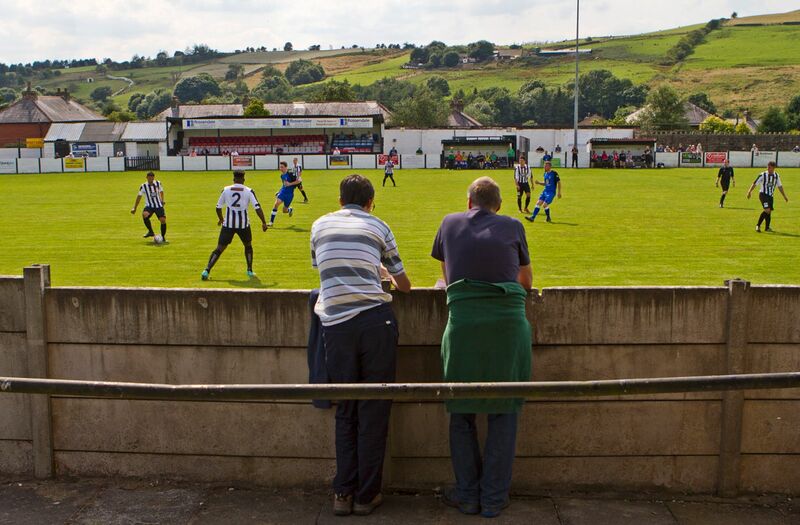 At non-League grounds, you can walk between the pub, the ground and to your seat without any trouble. You can get the to bar at half time and pick up a pint and a pie without missing the second half or paying over a tenner for the privilege (special mention here to The Emirates). There is a relaxed nature to the whole match day experience. Supporters are simply enjoying being at football and everything that goes with it. Every true football fan is on the lookout for that ‘Roy of the Rovers’ romanticism that keeps lower league and non-league supporters coming back for more. At the start of every season, fans hold faith that they can start creeping their way up the table or go on an enthralling cup run. Round every corner is the opportunity to face one of the big boys in the FA cup or a fallen giant relegated from the upper echelons of the English leagues (Harringay Borough vs AFC Wimbledon at the weekend is a pertinent example). When you’re on one the bottom rungs of the footballing ladder, the only way is up. It’s like real-life Football Manager, and it’s equally as addictive. Without starting a separate rant about how football is betraying its working class roots (though this certainly is worth ranting about), it goes without saying that top-flight football is still too expensive. The latest BBC Sport ‘Price of Football’ suggested that whilst prices had dropped year-on-year, the cheapest season ticket for Spurs, Arsenal and Chelsea will set you back at least £650. You might say that you get what you pay for – but for many, this cost isn’t sustainable. In the International break Leyton Orient are selling tickets for a fiver in order to showcase the non-league alternative. The tickets sold out within days. This demonstrates how cut-price football resonates with those wishing to experience a footballing day out without breaking the bank. With league football making way for internationals this week, there will be plenty of gaps in the football fan’s diary. I’d implore anyone to look up their local team and experience what non-league has to offer. What this level lacks in superstars, it more than makes up for in genuine passion and community spirit. For every footballing purist, it’s an experience not to be missed, and one that will keep you coming back for more.